My latest PopMatters article is now live: A Venue for Spectacle. One thing I neglected to discuss in this article about Michael-Bay-explosive grandeur is the audience. 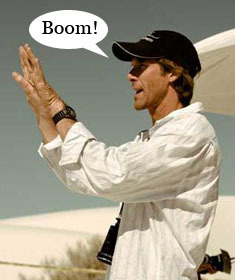 Do you know why Bay's awful films and Roland Emmerich's nonsensical storylines earn so much money? It is because millions and millions of people love to watch huge things destroy other huge things in large scale visual spectacles. Games have capture immense scale amazingly well for some time now. Shadow of the Colossus is every bit as thrilling as an action packed adventure offered up by so many trash directors of Hollywood. However, not that the visual fidelity and richness of our digital worlds competes with, and surpasses, the sparkling effects of Transformers and 2012, games offer a new source of spectacle for all the men and women who just want to watch the world burn. None of his is a value judgement on the desire to simply watch gorgeous action unfold over otherworldly and immense landscapes. Sometimes I am perfectly content with watching spectacular garbage. flung at the screen, especially in 3D. But as the medium proves itself as a viable venue, or even a replacement, for the adventure spectacle long-maintained by the film industry, an audience shift may alter the entertainment landscape. An influx of adventure junkies into the games community would likely alter cinema more than it would the games industry. Action directors may find themselves producing movies more akin to games than vice versa. However, more than likely things will still roughly the same. People will always spend good money on watching things sway, topple, and go boom - more than enough money to keep the spectacle coming in triple-A games and Oscar ignore cinema.